A couple of weeks later, the men were at the same restaurant but in a different waiter’s section. Monica left her area to go thank the men for their prayer and shared that the Lord had led her to a new church home. She said she felt closer to the Lord than ever and that He was providing some clarity for her. Then she asked if they would continue to pray for her. They each extended a hand to her. And the prayer offered in faith will restore the one who is sick, and the Lord will raise him up, and if he has committed sins, they will be forgiven him. – James 5:15. While the context of this passage is around elders of the church being called on to anoint and heal a sick man, it is applicable today for those walking in the power of the resurrected Christ and indwelling of the Holy Spirit to pray for all who are sick and hurting. The dimension that gets overlooked at times is how personal the action is. Jesus healed individuals, not groups of people. Taking the initiative to focus on individuals and opportunities to pray specifically, glorifies the Father. Over the seventeen years of Faithful Fathering, one of the most powerful takeaways from our ministry activities that men have thanked me for years after the fact is the charge to begin praying for their children by name every day. I have heard stories of how the Lord brought a lost child home, reconciled strained relationships, introduced the right man into a daughter’s life, strengthened him as a dad to be the spiritual leader in the home, etc… Click HERE for a copy of that prayer guide. Today, the charge is to take the initiative to extend a hand to the waiter the next time you go out to eat, especially if you go as a family, and ask what you can pray about for them. Their request may be shallow or deep but be willing to stand in the gap and embrace the opportunity the Lord has put before you – And the prayer offered in faith will restore the one who is sick. Prayer guide: Lord, thank You for restoring me. I know the prayer offered up daily by my mother was in faith grounded in You. You heard her prayer and have drawn me closer to You for Your purpose. Thank You for forgiving my sins and for raising me up for the journey as a man, husband and father. Guide me as a God-glorifier where You have me. Strengthen me to stand in the gap to pray in the powerful name of Jesus the Christ to rebuke distractions and evil attacking my family and others You put in my path. Amen. 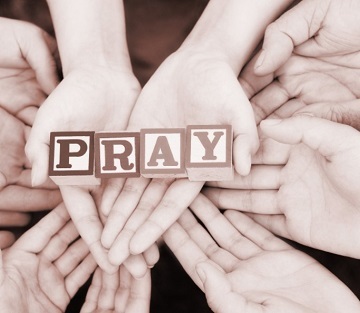 A faithful father takes the initiative to pray daily over his wife, children and others. I have been negligent in letting you know about these great emails! This one reminds me to double down on specific prayer over my family and challenges me to include prayer for those in my path as well! Thanks! Thanks, Rick, it's always good to be reminded how powerful prayers can be.